Do you Want to Be a Great Leader or a Good Leader? Maybe you need to be both! Maybe “great” and “good” are not points along a common scale but are actually very different aspects of leadership. 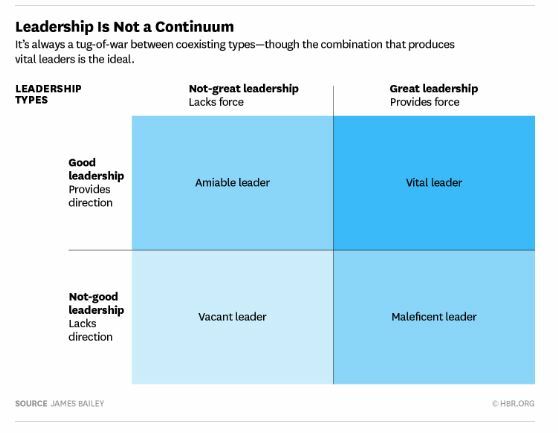 The chart below puts forth a view of leadership that is a bit different from traditional that I believe gives interesting insights for navigating the challenges and paradoxes of being the best leader one can be. The world tends toward continuums. We order everything from temperature (cold to hot, with tepid in the middle) to wealth (poor to comfortable to rich). Continuity along a linear line, like the inexorable laws of hydrodynamics, helps to capture and comprehend the complexities of science and society, and offers the promise of progress and growth.